to conduct research and develop a guide. By the request of the Department of Education of Moscow, Art. 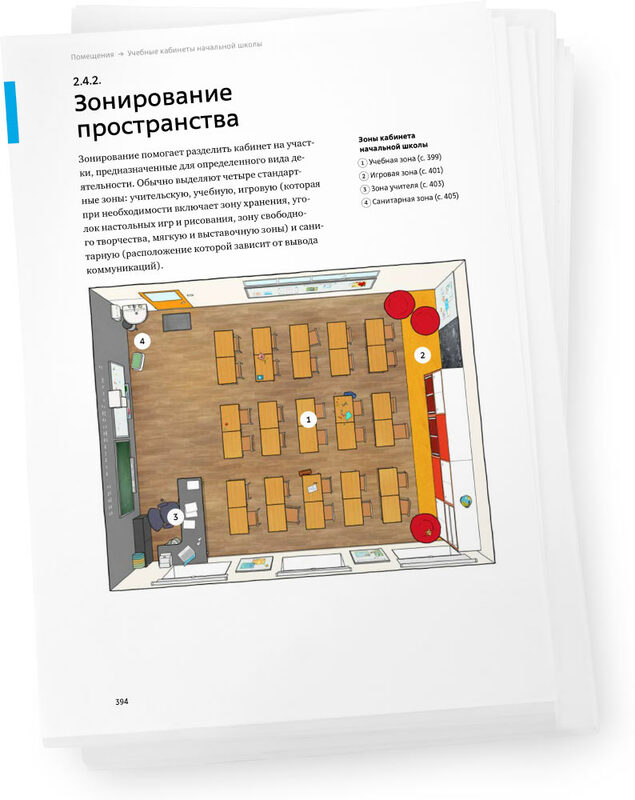 Lebedev Studio and Moscow Architectural Institute have developed a standard school design guide based on large-scale preliminary research. The guide formulates principles of good design of education environment which will help make schools beautiful and comfortable for both teachers and students. 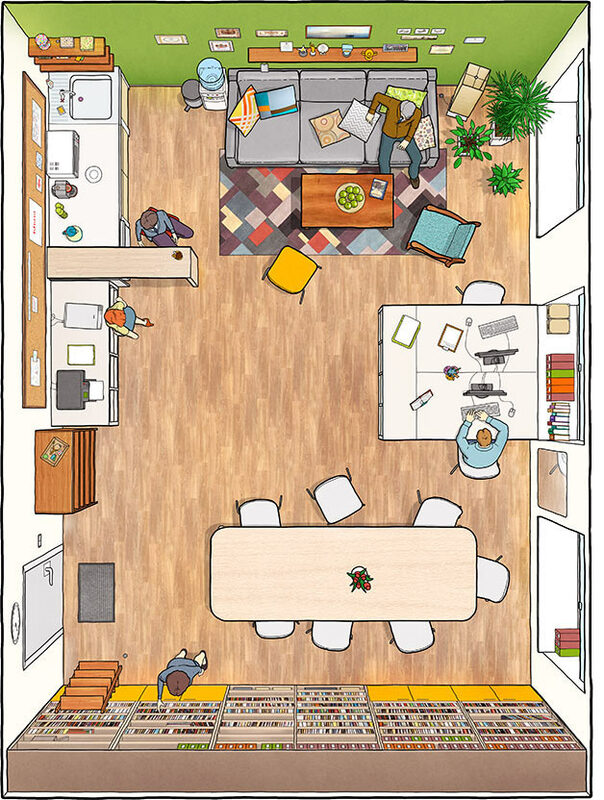 The guide includes recommendations on layout and finish of classrooms, lighting, purchasing furniture and equipment and provides sample graphic design solutions. The comprehensive approach reduces costs, cuts down planning time and helps create a coherent visual environment. 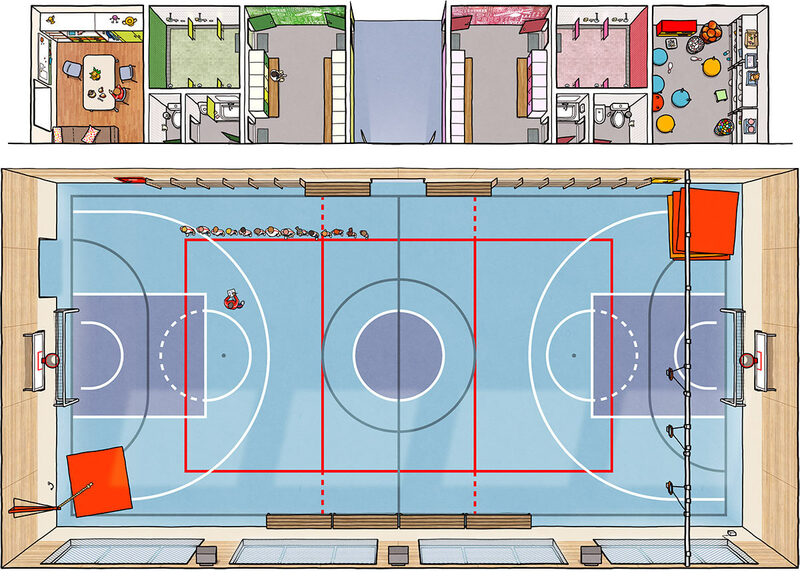 Space zoning helps organize areas for study, recreation, games, equipment storage and parent waiting. 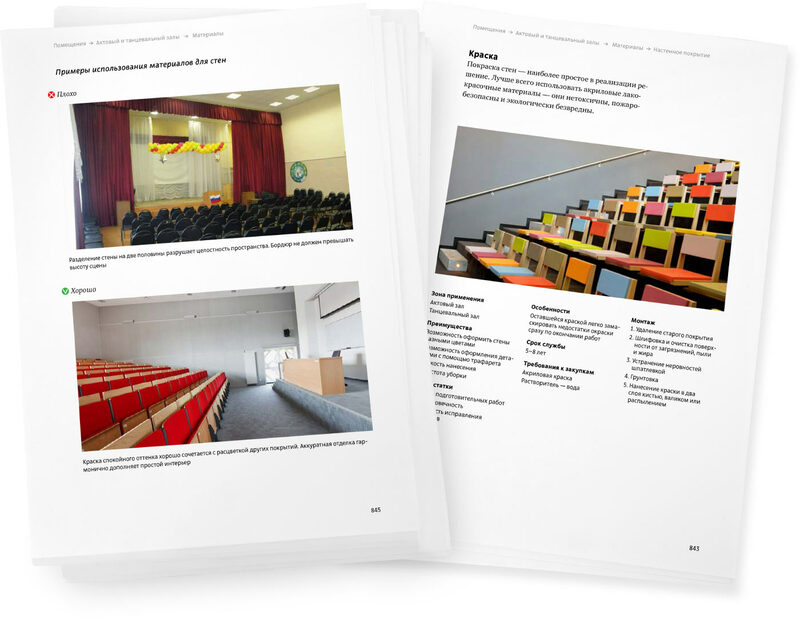 Sections of the guide are accompanied by illustrations of sample interiors developed based on the research and study of European schools. 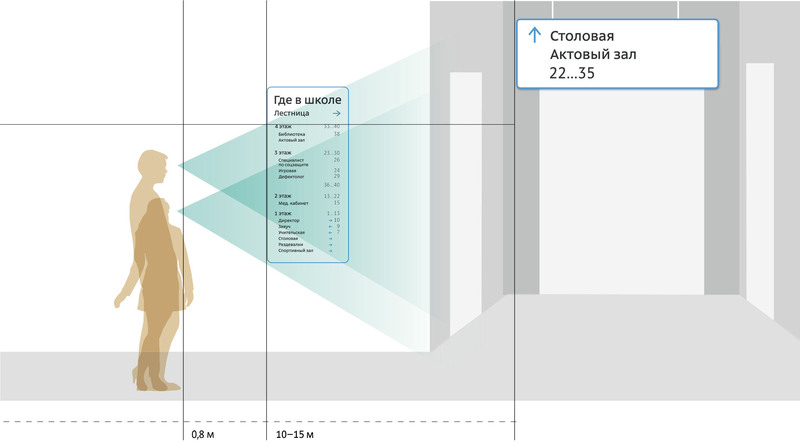 Different types of areas are presented in their own sections of the guide. 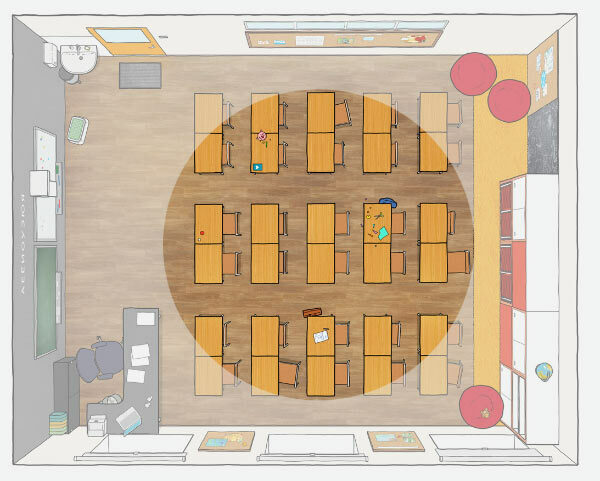 Special attention is given to the design of classrooms for elementary and middle school classes, the cafeteria, assembly halls and gyms, washrooms, corridors, recreational areas, library, checkroom, doctor’s and administrative offices. Each of these areas has its own distinctive requirements which are represented in the guide. For example, flooring at the entrance, in the cafeteria and in washrooms should be water-resistant, while in the gym it should be cushioned. The guide includes information on benefits and shortcomings of various materials, their service life, installation and purchasing requirements. All information is supported by photographs of successful and unsuccessful finishing. 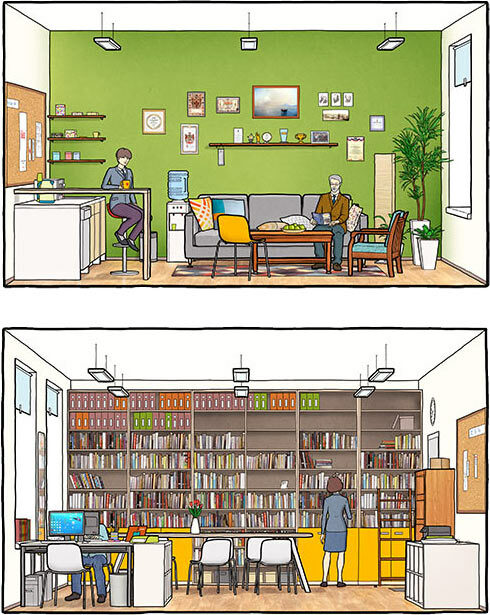 The illustrations help understand the nuances and avoid common mistakes during renovation. 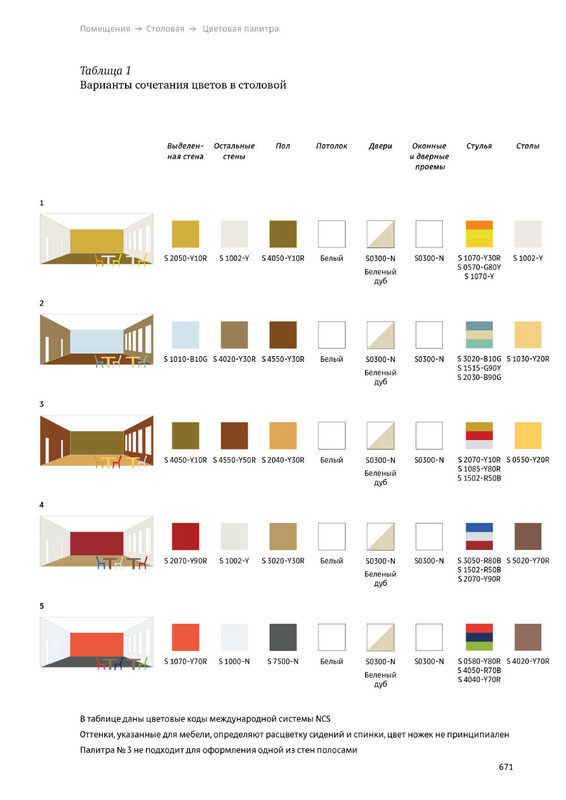 Prepared color palettes for finishing take into account the purpose of the rooms and the lighting. Special attention is given to the furniture. The guide explains in detail how to choose items with required characteristics, arrange and safely position them. 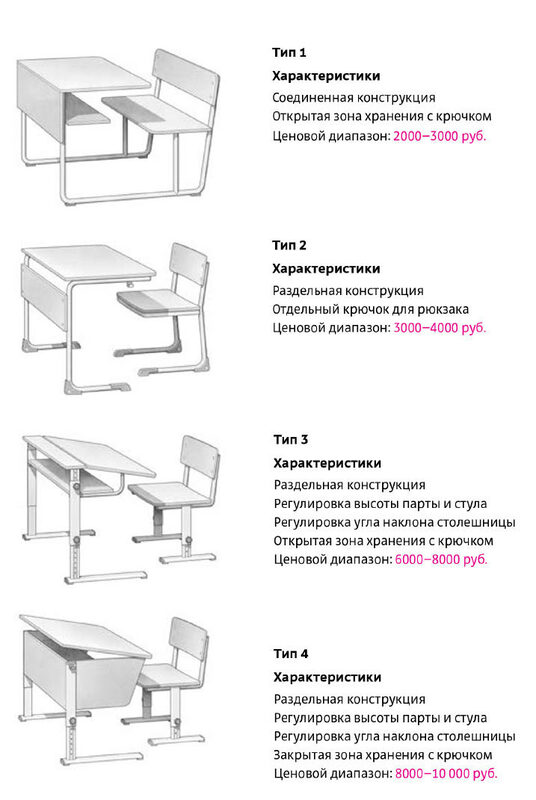 Student desks are chosen based on ergonomics. 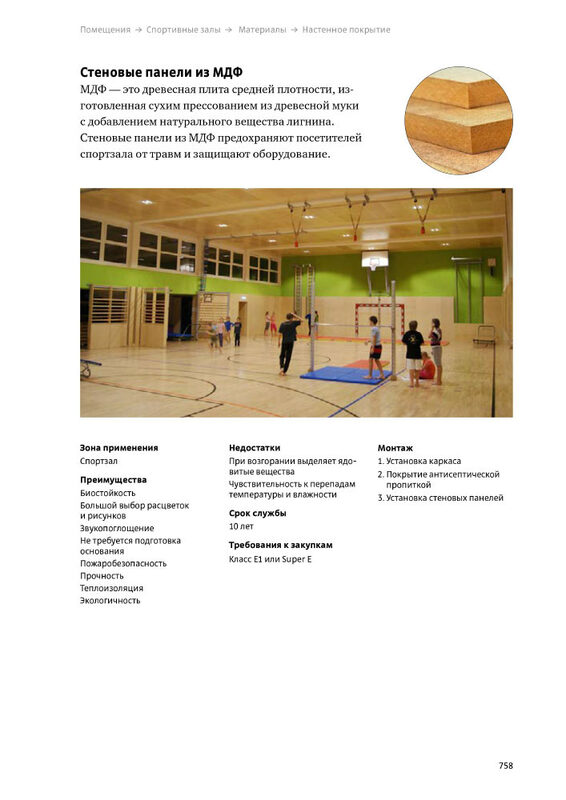 Price range: 8000–10 000 rub. 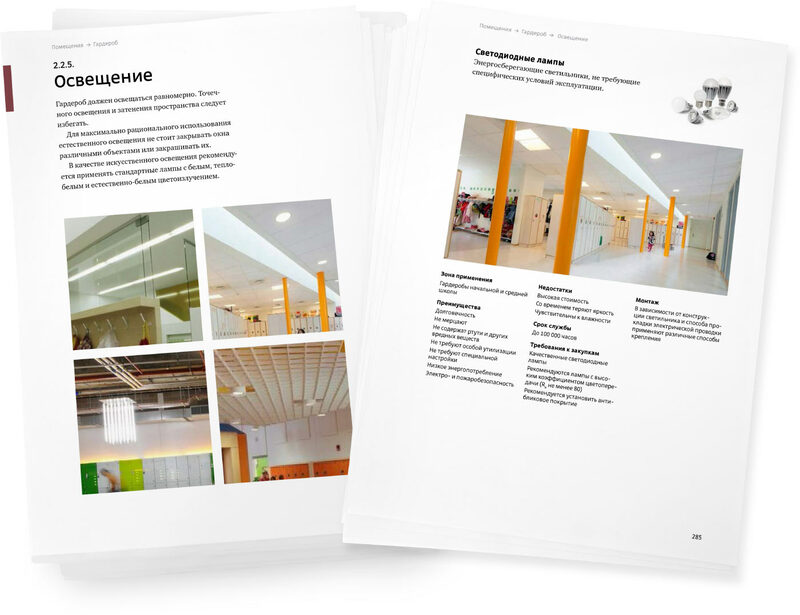 Lamps recommended in the document comply with all sanitary standards and are easy to maintain. The guide provides recommendations for placement of all interior details and even offers advice on placement of hooks, coat hangers, trash bins and soft pillows. Such a careful approach helps make school areas comfortable and cozy. The guide includes signs that can be used in any school. They help new students and parents find a classroom or a hall and bring variety to corridors and recreation areas. Detailed recommendations help select and place diagrams, maps, charts and posters. 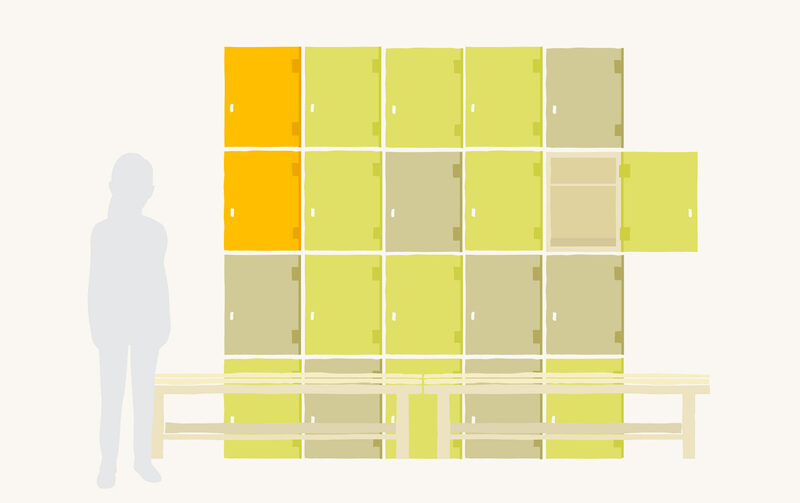 Graphic elements that can be used in decorating corridors and classrooms were collected in an image bank open to all schools. 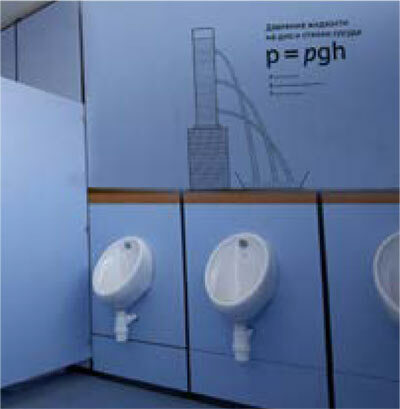 Walls can be decorated with bright and informative illustrations on prepared stencils chosen by architects and designers on a competitive basis. Rules, diagrams and formulas become elements of graphic design. Illustrating complex material with real-life examples makes it easy to understand. 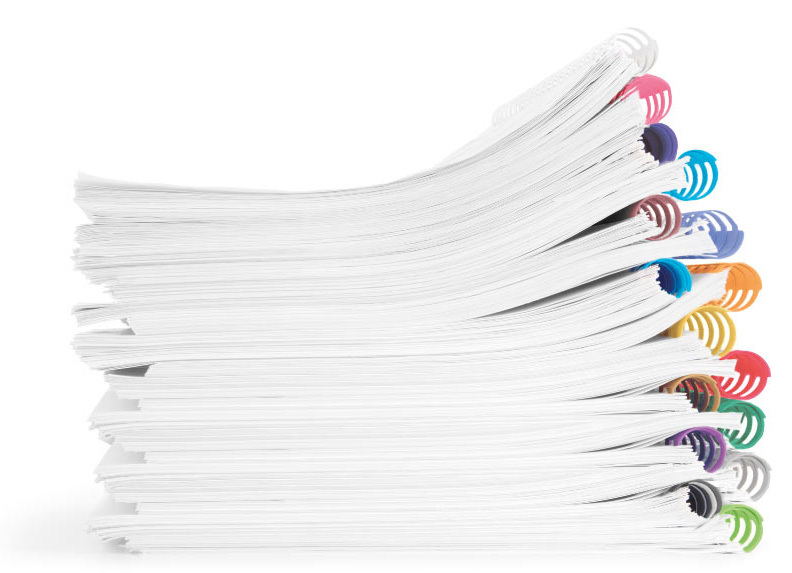 Prepared document templates make working in a word processor easy and bring order to school documentation. Recommendations for writing texts are also included to help working with the content. Model typography facilitates perception of information and accustoms children to good style. A single typeface and a set of pictograms are used in the design of announcements and schedules. Small images do not distract from the text yet bring variety and reduce formalism of written notices. Developers welcome expert opinions and invite engineers, teachers and school administrators to submit their comments using the feedback form.